A distinctive rich copper colour and delicious malty flavours. This is one of Canada's favourite beers. Uniquely smooth and very drinkable. 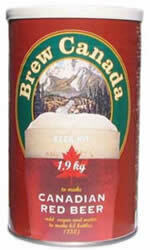 Expertly developed by a professional Canadian Brew master patterned on Canada's favourite commercial beers. Manufactured using the finest traditional Canadian Brewing ingredients including genuine concentrated brewing worts and fresh varietal hops to produce beers of outstanding Canadian quality.